I graduated from Kent State University on May 11, 2002, eight years ago today. As a gift, my husband (who back then was my fiance) gave me a silver heart-shaped locket with “Alanna & Mark” and the date engraved on the back. That day is imprinted into my brain like the letters and numbers etched in the silver. 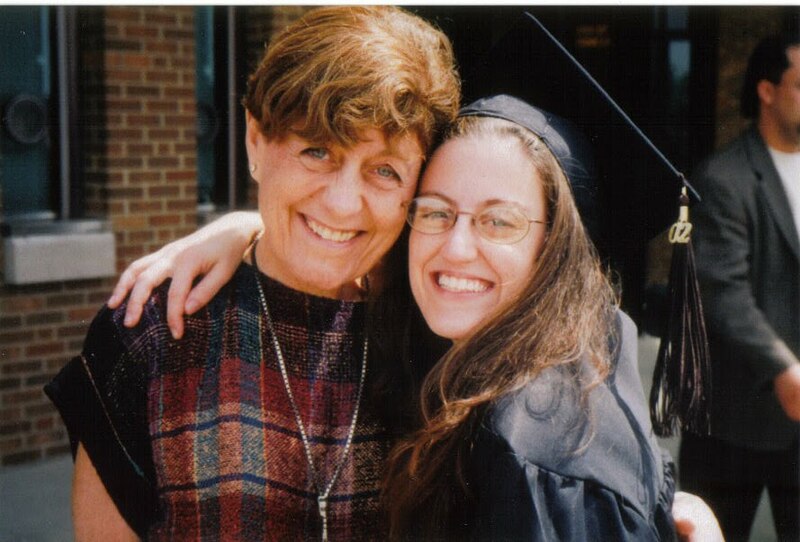 The photo is a picture of me with my Aunt Joni on graduation day. She’s struggled with Alzheimer’s for the past few years, and they don’t know how much longer she’ll live. I wanted to post this photo as my tribute to her. It’s because of her I went to Israel at the end of 2000, it’s because of her I took Hebrew for my foreign language instead of the usual French or Spanish, and it’s because of her, in large part, that I am who I am today. She encouraged me to write and to believe in my dreams. I didn’t intend for this to happen, but on May 11, 2009, I created another important anniversary: I’ve kept a writing log for exactly one year. The writing log has been an enormous game-changer for me, as far as my writing life is concerned. Most of you have read this, but if you’re new to my blog, I wrote about my writing log in my essay for one of my favorite blogs, the Procrastinating Writers Blog , called Logs, Frogs, and Blogs. The partial inspiration for this post came from another favorite blogger of mine, John Ettorre’s blog Working with Words. I can only link to it through the archives; it’s the post dated 11/23/09 called Secret Anniversaries of the Heart. This prompts me to ask you, fellow readers and writers, three questions. Please feel free to leave your comments on any or all of the questions, along with other thoughts. 1. What are your personal anniversaries? 2. If you are a writer, what devices do you use to keep yourself writing? 3. Who in your life has helped you to believe in yourself (as a writer or otherwise)?